Once a month, a group of up to 15 inmates at the Stony Mountain Institution, just north of Winnipeg, will meet with a volunteer at the penitentiary's library and spend about two hours discussing a book that they've been reading. The program made its way to Stony Mountain a few years ago, part of a growing phenomenon in the Canadian prison system spearheaded by a Toronto-based charity called Book Clubs for Inmates. Among the program's volunteers is John K. Samson, the famously Winnipeg-based singer-songwriter with an unquestionable passion for the written word. He was best known for fronting beloved rockers the Weakerthans a band built as much on Samson's evocative lyrics as they were on their warm, mellifluous folk-rock sound, until their disbandment last year. More recently, he's taught creative writing at the University of British Columbia, edited at ARP Books (the publishing house he co-founded in 1999) and now, after stepping back from those roles to allow more time for his music, he works part-time with his wife, musician Christine Fellows, as writer-in-residence at the Winnipeg Public Library. Samson is surrounded by writing and literature, whether it's his own songs and poems, the manuscripts he reviews for fellow Winnipeg writers or the novels featured at Stony Mountain. "The conversations they spark are always fascinating to me, and I'm really grateful for them," he says of the prison book club. "And I think they've influenced how I feel about the world in a way, and how the idea of prisons leaks into all of our lives, as a metaphor and in a literal sense. It's reaffirmed my belief in prison abolition and reform, and the idea of recognizing the human in every human, and recognizing that there's value in everyone and in everyone's stories." Like most of his work, Samson's second solo album, Winter Wheat, deals heavily in metaphor. It also marks a return to his natural writing style, driven by narrative and feeling, after the more studious Provincial. Throughout the 15-song Winter Wheat, Samson takes special interest in the concept of addiction — to drugs, screens, fossil fuels — and mental illness, while also drawing from Neil Young's album On the Beach and a variety of books that have resonated with him. "I was encouraged to let it sprawl, to expand my range," he says. "I felt like Provincial was very much focused on research, whereas this was a return to the personal and political. I'm not sure exactly how other writers helped me with that, but I do feel like they did." By now, Samson's followers should be used to long waits between albums. 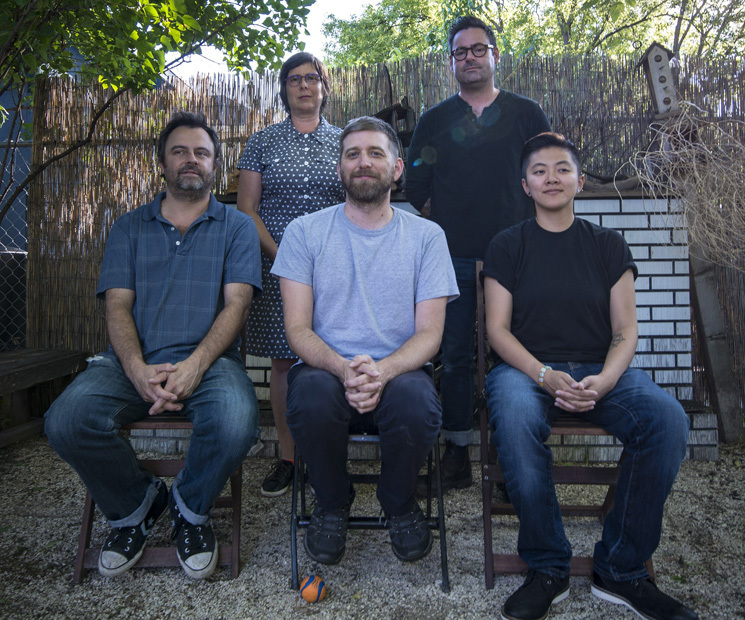 Winter Wheat arrives almost five years after the release of Provincial, itself the first full-length album of new material from Samson since the Weakerthans' Reunion Tour in 2007. Chalk that up to him being a slow writer; he says he only writes about three, maybe four songs a year. And he says the distractions of the modern world are certainly no help. "I do feel sometimes like the fuses blow on my capacity to write about the world, due to how connected we all are," he says. Samson even has a writerly way of speaking — softly, slowly and deliberately, taking care to consider each thought and select the words that will best convey it. "I definitely need to be bored. I need to be bored enough that I want to make something that'll make me less bored. And I find the spaces for that productive boredom to be shrinking with every advancement. I feel like there might be too much information for me." But things have been falling into place. His new job not only gives him time to play shows and promote his new album, it also means he has an office at the local library; that's a significant perk for someone who already spends as much time there as he does. His involvement in Winnipeg's writing community has resulted in a number of engaging projects, including some short films and, most recently (and probably most notably), a live score he and Fellows wrote for a Neil Young-inspired choreographic piece called For the Turnstiles (which went on to inspire much of Winter Wheat). In 2010, he was even named Winnipeg's art ambassador for music. Through his work, Samson has found he also has plenty to offer — and gain — as a teacher. In their current role at the Winnipeg Public Library, he and Fellows look over manuscripts from aspiring authors and mentor people who want to learn how to write their own songs. "That's just an incredible experience, and I think it's really encouraged and expanded our writing as well," he says, adding that the workshops they hold are strictly about the art of writing. "We're always very clear that we have no interest in talking about the industry, and we don't have any advice on that," Samson says. "What we want to focus on is the work itself. And I'm actually being very honest when I say that I really do have no idea — I think it's a total fluke, almost a mystery, why I have a career in the music industry. It's a series of incredibly lucky events, whereas I know lots of people who are incredible writers who don't make a living from music. So I have no advice to give in that sense, but I feel like I do have something to offer people who want to explore and express themselves." While songwriting may be his greatest passion, and the activity for which he's best known, his raison d'être seems to be connecting with people through literature. Samson says he has no real plans for his music career; he'll do whatever seems like the right next step, whenever it seems like the right time. Meanwhile, he finds fulfillment in the conversations that arise from reading and writing, whether it's university students looking to become published writers or inmates looking for a personal outlet of expression. "I really love discovering those kinds of places where you get to speak openly with people whom you generally wouldn't get to talk to. Songwriting and literature have been kind of my ways to do that," Samson says. "Being able to do something where showing up and paying attention is meaningful, it feels profound to me. I really appreciate it."